Although other parts of the country might see more dramatic seasonal changes in the fall, Southern California gardeners will still benefit by performing certain fall gardening clean up chores. This is especially true if you are an avid rose or flower gardener. Many flowering shrubs and perennials greatly benefit from fall preparation as they will go dormant during the fall and winter months regardless of what part of the country you live in. So, what exactly needs to be done in the garden during the autumn months in preparation for winter? Because weather conditions in Southern California are conducive to long growing seasons, it is important not to encourage your plants too much during what should be their dormant season. Many plants benefit greatly from a dormant season. This gives the bulbs, or root system a chance to rest and absorb important nutrients from the soil. However, even a small bit of encouragement from you might discourage the plant from entering dormancy in a warm climate. To discourage more new growth, you should discontinue pruning and fertilization. Any pruning will activate new growth. The best time to discontinue pruning and fertilization is after your plants have completed their regular summer growth cycle. Plants that are allowed to go dormant will be healthier and more beautiful in the spring. Weeding in the fall will have the most efficient effect on spring weeds next year. During this time of year, many types of weeds are producing seeds or are about to produce seeds. If you weed now you will prevent these seeds from finding new homes next year. Each weed you pull will literally prevent many new weeds from growing later. If you plan on saving any seeds from your flowering plants, now is the time to collect those. You will need to allow the desired flower to mature on the stem without deadheading. Collect the seeds you want to keep and dry them on paper towels. Collected seeds should be stored in a cool, dry place until spring planting time. Even though fall is the time when many plants will go dormant it does not mean planting is off the table. In fact, trees, shrubs, bulbs, perennials and some grasses do the best when planted in the fall. During the relatively dormant season, these plants will have a chance to establish their root system before the vigorous growing season in spring and summer. Having time to get this jump start on the root system will result in healthier more vibrant plants. This is when you will want to begin bringing in tender plants which need overwintering indoors. If you are not sure what a plant’s winter needs are, be sure to do your research. Unpredictable weather patterns in the fall and winter can lead to devastating loss for plants left unattended outdoors. Use this opportunity to clean up and store unused pots. If left out during the winter pots can set up fungus, create standing water hazards or be destroyed with dry rot. If you wish to reuse the pots in the spring it is important to store them properly. Removing leaves or debris from your grass covered areas now will ensure a beautiful lawn come spring time. When debris is allowed to remain on top of grasses, grass can die and lose its root system during the winter. This will cause you more expense in the spring in an effort to replant grass. If you plan to nourish your soil over the winter, now is the best time to add manure. This is the time of year when very strong fertilizer can be added to soil and it will have time to “mature” during the winter months. This is the most ideal way to amend soil. Other autumn gardening chores include reseeding lawns and bringing houseplants back inside that have been allowed outside during the spring and summer months. This is when you should be scrupulous with your roses concerning pests. Inspect the roses weekly or daily if needed for spider mites and aphids. Remove pests quickly. Rinse down foliage early in the day to prevent powdery mildew but make sure you perform this task early enough in the day that the foliage can dry before nightfall. You should discontinue liquid feedings by the middle of October, paying special attention to cleaning out any rust infested leaves. Cut out and sacrifice any pest infected buds or blooms. This will interrupt the pest life cycle, thus protecting your rose from further damage. In November you can discontinue deadheading. Instead, pull petals from blooms. This will allow rose hips to develop. This is an important step in the dormancy process. This sends the signal to the rose bush to slow down growth and begin to conserve energy for winter. Reduce watering to 2 times per week now also to prevent vigorous growing. 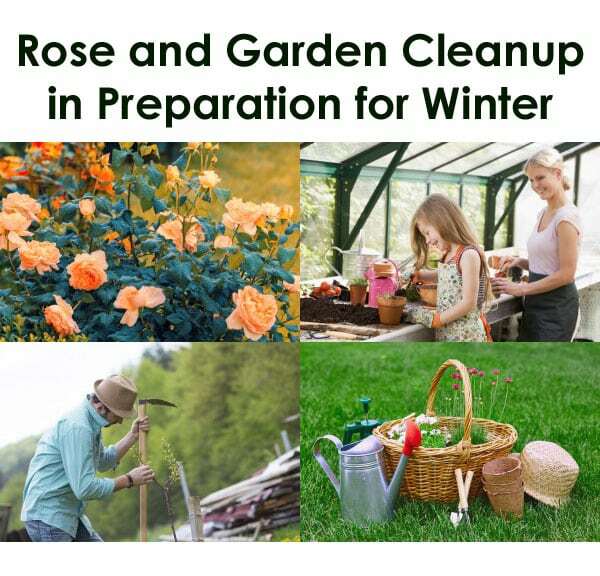 In December you should make the hard choice concerning which rose plants did not perform well for you. It is more beneficial to your overall rose garden to remove these weak plants. This will give you an opportunity to amend the soil in that area and try again with a new healthy plant.